The legal team at Joe Horrox Law is committed to helping people in and around the greater Daytona Beach area following serious collisions and accidents. This is particularly notable as Daytona Beach Bike Week approaches (Friday, March 6th to Sunday, March 15th). When serious motorcycle accidents cause injuries and death, accident victims and their loved ones can count on our team to provide sound counsel and guidance. Below we would like to note some basic motorcycle laws. 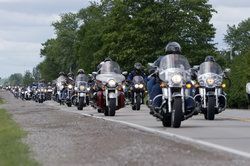 Knowing these Florida statutes can keep you safe and out of trouble during Bike Week. Helmet Laws - Riders are not required to wear helmets if they are over 21 years old, though a minimum of $10,000 in medical insurance should be in place. Florida requires eye protection to be worn. Earphones and Helmet Speakers - Earphones and earbuds are not allowed to be worn while operating a vehicle. Helmet speakers are permitted, however. Vehicle Sound Laws - Modifying mufflers is not permitted if it is done as a means of increasing the sound emitted by the stock pipes of the motorcycle. 82 dBA is the maximum sound level for bikes made before 1979; 78 dBA is the maximum for bikes made after 1979. Height of Handlebars - The handlebars of the motorcycle should ideally be no higher than the rider's shoulder when seated. Lanesplitting - Lanesplitting is never allowed. Motorcycles can ride two to a lane, however, with other safety matters considered. Wheelies - This is not permitted in the state, with a fine of $1,000 for the first offense. Drinking and driving is obviously illegal. The legal limit for BAC is 0.08 like the rest of the country. Arrests may be made even if a motorcyclist is within the legal limit if he or she exhibits signs of intoxication or recklessness on the road. It's important that motorcyclists abide by all rules of the road, including signals, posted speed limits, road signs, and so forth. Signaling and using headlights is also important. Simply by being as safe and courteous to other motorists, you will prevent major accidents from occurring. With so many people in town for Bike Week, accidents can occur. As we noted in a previous blog post, there were a number of serious motorcycle accidents during Bike Week 2014. Those involved in such instances and their loved ones can rely on our attorneys to help recover damages and ensure excellent legal outcomes. We are here for you in your time of legal need. To learn more about your legal options following an auto accident during Bike Week, be sure to contact our the legal team at our personal injury law firm today. At Joe Horrox Law, we will carefully examine your case and help ensure that justice is served and the system works fairly for everyone.